Nigeria social media was thrown in shock yesterday when reports of how Davido and Wizkid's crew fought each other at the venue of the One Africa Music Fest concert in Dubai. According to NET, an eye witness who was present at the event claims that Tekno was the victim of physical assault by Wizkid's manager, Sunday Are, this is what made Davido to jump in with his goons, thereby escalating the issue further. 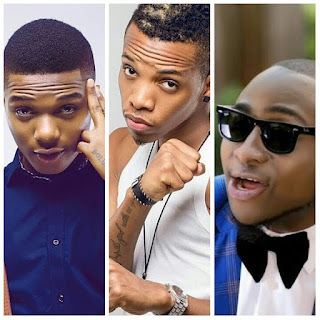 Tekno is said to have approached Wizkid's camp to greet them. He stretched his hand to shake hands with Sunday Are, who is way older than him. The elderly man found Tekno's act disrespectful and reacted by punching him. "Sunday Are was annoyed that a small boy like Tekno can be so rude to shake hands with him instead of bowing down or prostrating,"
"He didn't even calm down, he just punched Tekno and pushed him. Immediately the backstage area erupted as people around Wizkid gathered round Tekno and threatened to beat him up further. By this time Davido was on stage and the fracas spilled over outside. As soon as Davido was done and he heard what happened, he rushed towards the scene with his people." "Wizkid was slapped, Small god, Wizkid's right hand man was the man attacked by Davido's Lati in the video circulating online." Meanwhile Davido has taken to Twitter to show more support for Tekno. Saying no one will ever touch him (Tekno) again.